Andrea Sanchez Walk has set her sights on becoming a doctor. A research opportunity at the University of Wyoming may help her to reach her goal. Sanchez Walk earned her associate of science degree from Western Wyoming Community College. 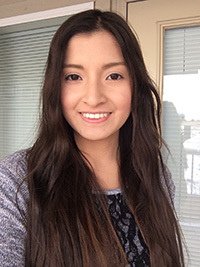 She is one of nine students from Wyoming’s community colleges who received Wyoming INBRE Transition Fellowships to study and conduct research at UW. Through a competitive selection process, the Wyoming IDeA Networks of Biomedical Research Excellence (INBRE) program awards transition fellowships to Wyoming community college students who transfer to UW to pursue bachelor’s degrees in biomedical-related disciplines. For two years, students receive $2,500 each semester to study and receive training in UW research laboratories. There also is the possibility of support through the Wyoming INBRE Undergraduate Summer Fellowship Program that provides $3,500 for the summer, says Scott Seville, Wyoming INBRE principal investigator and program director. Students must maintain full-time enrollment and at least a 3.0 GPA while being supported. They must commit to working about 10 hours per week in a laboratory on a mentored independent research project. They also are required to attend INBRE seminars and events as their course schedules allow, and present results of their research at Wyoming Undergraduate Research Day. “To facilitate the transition from their colleges to the university, junior and senior transition fellows meet regularly with the INBRE personnel to discuss and address transition challenges, share experiences and engage in a supportive community of student scholars,” Seville says. Sanchez Walk, a molecular biology major, guided by her faculty mentor Wei Guo, an assistant professor in the UW Department of Animal Science, is researching why people develop cardiomyopathies, the number one cause of death worldwide. Wyoming, with UW as the lead institution, is one of 23 states and Puerto Rico funded by the National Institutes of Health INBRE program. INBRE funding is intended to enhance biomedical research capacity; expand and strengthen the research capabilities of biomedical faculty; and provide access to biomedical resources for promising undergraduate students throughout the eligible states. Cheyenne -- Samantha Haller and Kelsea Zukauckas, Laramie County Community College; and Hannah Jernigan, Sheridan College. Laramie -- Jessica Marsh, Laramie County Community College. Rawlins -- Rebecca Iacovetto, Central Wyoming College. Reliance -- Denise De Loera, Western Wyoming Community College. Riverton -- Sara Cisneros and Philip Gard, Central Wyoming College.